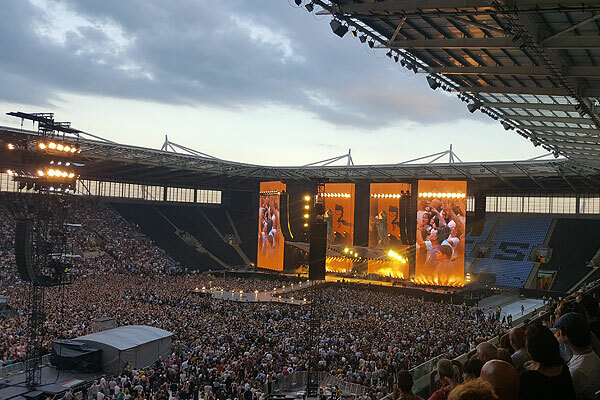 The end of last week saw Event Hire UK installing equipment at the Ricoh Arena Coventry for the legendary and iconic Rolling Stones concert that took place on Saturday evening. When it comes to the world of popular music, few acts rival the Rolling Stones, having been formed way back in 1962 and having enjoyed incredible success over the years. With estimated record sales in excess of 250 million, the legends that are Mick Jagger, Charlie Watts, Ronnie Wood and Keith Richards played to an adoring crowd at the Ricoh on what was a hugely memorable evening. The Event Hire UK supplied and set up various equipment including bars, cold rooms and much more to ensure the event was a great success. Yet another example of where our equipment is useful and in demand by event professionals. If you need to hire furniture, catering equipment, crockery, cutlery or glassware, then discover our various ranges online and place your order with the experts today!